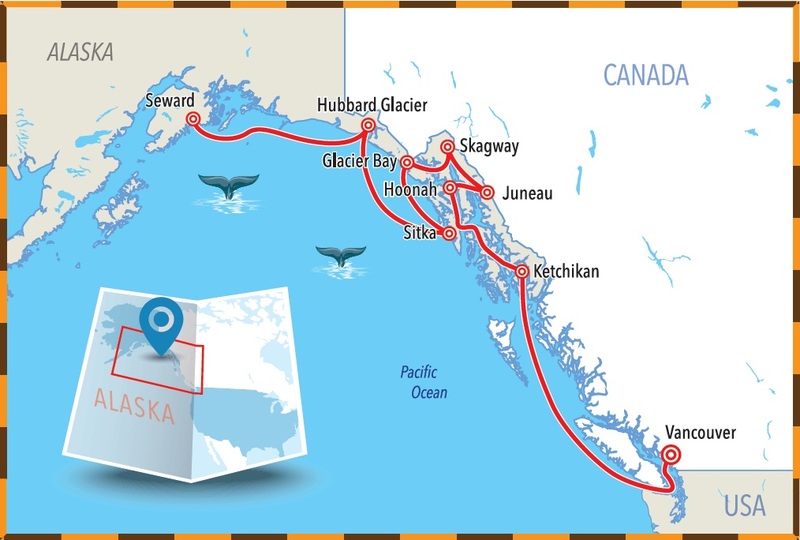 Alaska oﬀers a family holiday like no other – especially if you cruise with Crystal. Nine hundred pounds of quivering muscle, poised to pounce on its third meal of the morning. Me at the breakfast buffet? No, this was a brown bear. In the wild. In Alaska. Twenty yards away. And there was a lady with a pump-action shotgun standing next to me. It was possibly the most surreal moment of my life but definitely one of the best. And it was all thanks to a chance encounter in a coffee shop. Perched on Chichagof Island, the tiny settlement of Hoonah was the smallest stopover on our Alaskan cruise, with a population of just 860. That’s 860 humans, mind you. The local brown bears number in the tens of thousands, because the waters round here teem with salmon in the summer months, and Ursus arctos is rather partial to seafood. Or indeed any kind of food. This beast is a close cousin of the polar bear and no less fearsome, so my advice is this: don’t go for a walk in the woods unless you’re prepared for a really big surprise. Anyway, there we were in the woods. The sweet scent of pine mingled with the chatter of birdsong. Everything around us seemed brighter, louder, more real than we’d ever known. This was pure National Geographic. The salmon had spawned a new generation in the stream they were born in; now they themselves were food for the bears. This was life. But you’ll be wondering how come my husband and I, and our three girls, had ended up eyeballing a bear as it fished for its lunch. Well, we dropped in for a coffee at one of Hoonah’s few shops and started chatting to the lady on the till. “You wanna see some bears?” she asked. The girls nodded, hypnotised by her breezy confidence and her waist-length golden hair. Before we knew it, Alison (as we now knew her) or Goldilocks (as the girls inevitably dubbed her) had grabbed her gun and we were on our way. Alaska is like that. The people are relaxed, practical and very welcoming, but they do things differently here. They have to, in this vast wilderness with few people and fewer roads, where even the state capital can only be reached by sea or air. Tourism is its lifeblood now, which is why many folk wear two hats, and there’s nothing so unusual about a cashier turned wildlife tour guide. Our Alaskan adventure had begun in Vancouver, as most such cruises do. Perfectly situated between the Pacific and the North Shore Mountains, this is consistently voted one of the world’s top five cities to live in. Once you have got over the flight (ten hours) and the time difference (eight), it isn’t hard to see why. Walking and cycling are a way of life here, the terrain is easy and I’ve never seen a greener city. There’s shopping on Grenville Island and sightseeing from the top of Grouse Mountain (4,o00ft up by cable car and just 15 minutes from downtown). But I have to admit, the sight we were most excited by was our ship, Crystal Serenity, which we could see from our room at the aptly named Fairmont Waterfront hotel. On the morning of embarkation, while our luggage was conveyed directly to the ship for no charge, we ambled over to begin what we expected would be a long check-in process. But what a delight: with no queues and individual chaperones, we were into our cabin in under five minutes. It’s touches like this that win Crystal Serenity prize after prize. If you’ve cruised with Crystal before, you’ll be familiar with the incredible service they provide. If you haven’t, you’re in for a treat. Bucking the trend for supersized ships, Crystal Serenity takes barely more than a thousand guests. Fewer passengers means one of the highest staff-to-guest ratios anywhere at sea, and much more deck space for everyone aboard. What’s more, drinks are inclusive, as are tips, so there is no nasty surprise at the end of the cruise, and no fretting over what to give to whom (were we imagining it, or were the crew more natural and friendly as a result?). Cruising north from Vancouver takes you through the fabled “Inside Passage”, a network of waterways that hugs the ragged Alaskan shore, weaving round countless islands and sparing your ship the wrath of the open ocean. In places the seaway is no more than a few hundred yards wide – but in no time at all we saw our first whale spout. My husband, the girls and I sat at the rails, entranced, scanning the horizon like five Captain Ahabs. As it turned out, we’d have to wait for one of these incredible creatures to break the surface – but not for long. 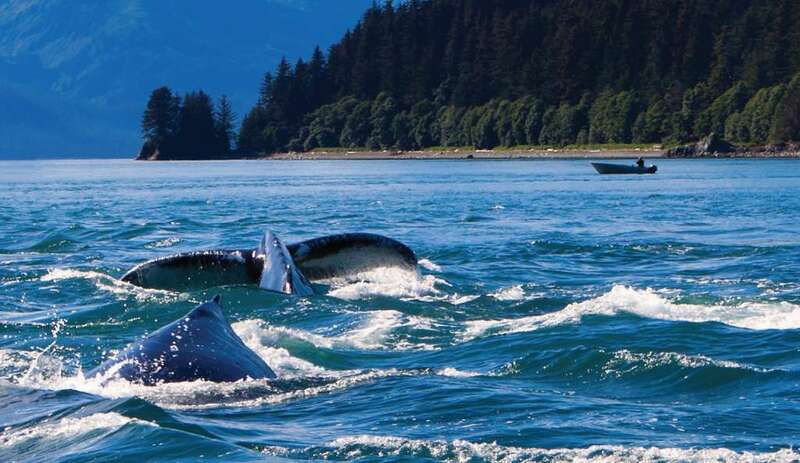 Alaska’s state capital, Juneau, may have a population of just 32,000, but there is something here for everyone. 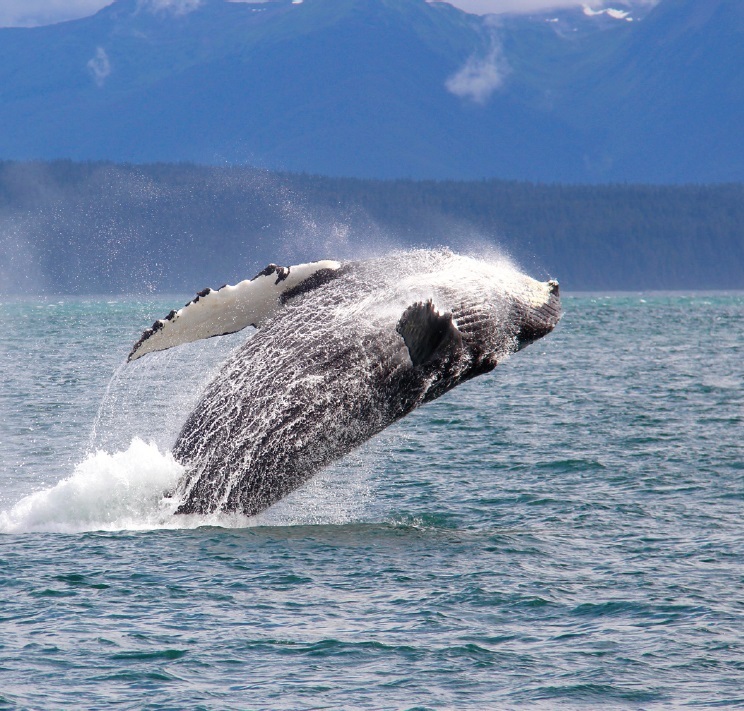 Most of it is outside, as Alaskans make the best of the summer months, and first up was a whale-watching cruise. Humpbacks crisscross this area in search of food before migrating to California or Hawaii to breed, and within minutes of casting off we saw another spout. Then, joy of joys, a huge shape emerged from the sea. The memory is seared into all our brains, but sadly not in my husband’s camera – he left the lens cap on and missed the photo opportunity of a lifetime. Other stops took in Skagway, the gateway to the Yukon gold rush, and Sitka, once a Russian outpost, where we took part in a spot of “voluntourism”. Introduced by Crystal as a way of giving something back to the communities it visits, this programme also allows guests to get a real taste of local life. Or, in my case, a smell. All I can say is that you haven’t lived until you’ve clubbed and gutted fish in an Alaskan hatchery. Whatever we’d been up to during the day, each night we returned exhausted but exhilarated to the luxurious comfort of Crystal Serenity, where our wonderful butler was waiting with Champagne for us and hot chocolate for the children. Yes, Crystal is high-end, and there are cheaper ways to cruise, but it has to be said the service was quite extraordinary. Nothing was too much trouble. The kids’ clubs were amazingly equipped to keep teenagers and toddlers happy for hours, and the evening shows and entertainment were excellent. As for the food, that was quite simply world-class, whether we were grabbing home-made burgers for a quick lunchtime snack or enjoying silver service at dinner. I didn’t think these extraordinary experiences could be beaten – but I was wrong. The highlight of the cruise was still to come: our day in Glacier Bay. Part of a 25 million-acre World Heritage Site, this is one of the few places on Earth where you can get close to tidewater glaciers as they melt into the sea. Serenity’s captain manoeuvred us to within a few hundred yards of the ice wall, and we listened as the glacier shifted, with the occasional gunshot crack and a background of ominous rumbling and grumbling. We viewed the mighty Hubbard glacier from a somewhat safer distance. Icebergs the size of ten-storey buildings regularly shear off it, explained the captain, and some of this “calving” happens underwater, so the icebergs shoot up unannounced. We saw his point. The cruise finished at Seward, the nearest port to Anchorage and our flight home. We waved Serenity off as she began her historic voyage through the Northwest Passage to the Atlantic, becoming the first cruise ship of her size ever to do so, and it felt like we were leaving family. Amazing service and hospitality, incredible scenery, a girl with a gun, and bears. Who could have asked for more? But I will leave the last word to the famous naturalist John Muir, who wrote in his journal that you should never go to Alaska as a young man because you’ll never be satisfied with any other place as long as you live. That may or may not be true, but I know where my children want to go back to this summer – and it isn’t the Costa del Sol. For 2017, Crystal Cruises offers seven, nine and ten-day Alaska itineraries on Crystal Serenity, with cruise-only prices starting from £1,878pp (seven-night cruise from Vancouver to Anchorage, departing 8 August). Price includes accommodation in a deluxe stateroom with picture window, all meals and soft drinks, most alcoholic beverages, onboard entertainment and gratuities. Call 020 7399 7601 or visit www.crystalcruises.co.uk.